Meet Trooper Walter Bell. He’s remembered with a plaque on the Crater walkway and is buried in the Dernancourt Communal Cemetery near Albert. 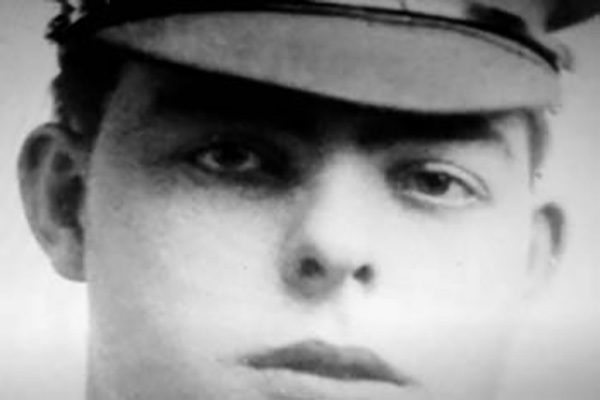 He was 20 when he was killed, on July 30th, 1916. 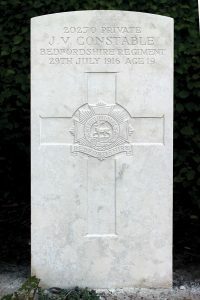 But this young man from the 9th Queen’s Royal Lancers is remembered back home at St Albans in Hertfordshire in a unique way – along with 109 other men from a single parish who died in World War One. His name appears on one of the ‘str eet memorials’ installed on the front of houses in the narrow streets and alleyways near the ancient abbey church of St Albans – the only memorials of their kind in the UK. 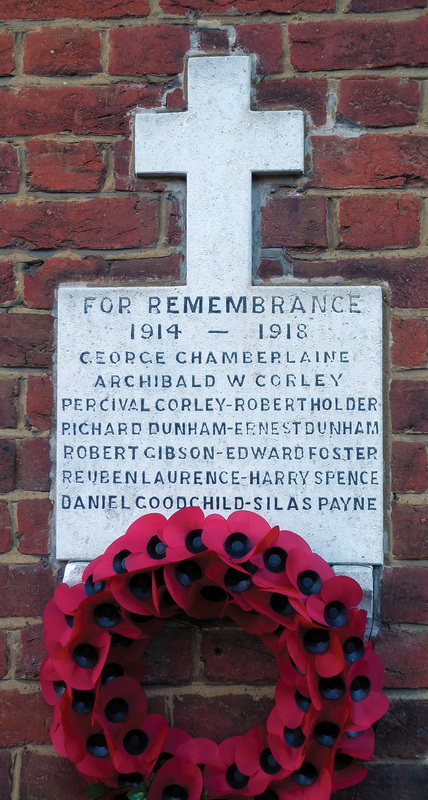 There are ten memorials altogether in Abbey parish, and they were all in place by the beginning of 1922. Walter lived in Day’s Yard off Holywell Hill, and his name is on the Holywell Hill memorial. What do we know about young Trooper Bell? 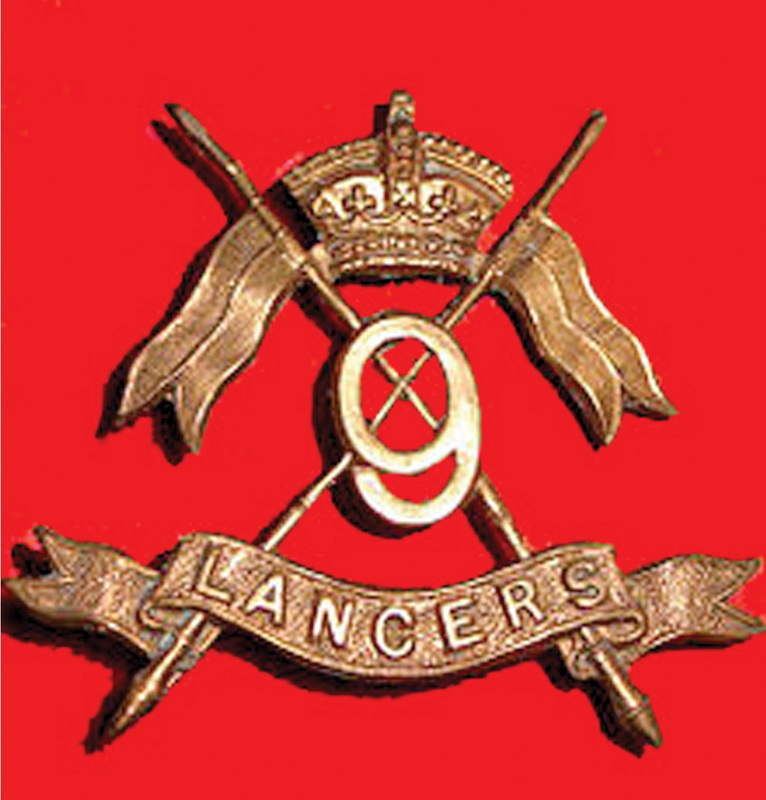 Angela Tarnowski, Curator of the 9th/12th Royal Lancers Museum in Derby, tells us that the 9th Lancers records show that he joined the Regiment in June 1915. He served with A Squadron. He would have known that the Lancers made two famous charges at the start of the war, in August and September 1914, but by the time he joined up and went to France, the cavalry had very little opportunity to fight on horseback; trench warfare meant that machine guns and artillery ruled the battlefields. T he Regimental history of the 9th Lancers gives us a clue about what might have happened to Walter. The main Regiment was quartered behind the lines in Querrieu, north east of Amiens. 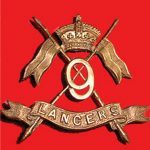 But towards the end of the first week of July, two officers and 57 other ranks from the 9th Lancers were ordered to work in what was known as a ‘Vulture Party’ under the 13th Corps, to help clear the battlefield in the area around Fricourt. Significant advances had been made in this sector since July 1st, of course, but it was still a very dangerous place. “It is by no means an easy party we have got on”, he wrote. It’s highly likely that Trooper Bell was killed on this ‘Vulture Party’, but as the party was serving under 13th Corps, no mention is made in the war diary or history of regimental casualties. Trooper Bell shares Dernancourt Communal Cemetery with another St Albans lad killed on the Somme. 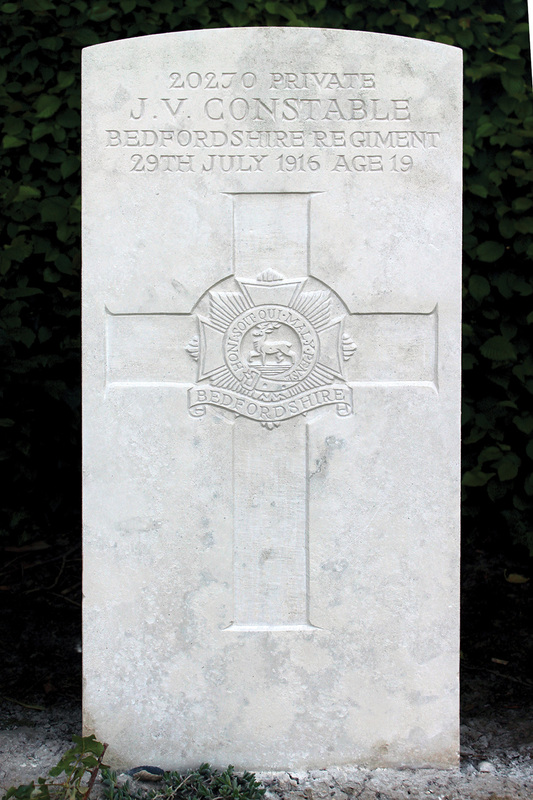 Private James Constable of the 1st Bedfordshire Regiment died of his wounds the day before Trooper Bell’s death. He was 19. His headstone now stands in a row only four away from Trooper Bell’s. Private Constable’s name appears on the Pageant Road memorial. He lived at 11 Pageant Road. 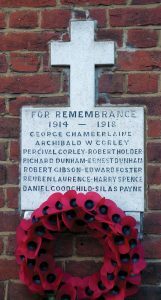 His next-door-neighbour at number 9, Private Edward Perham, of the 1st/22nd London Regiment (Queen’s) was killed in September, 1916, and his name is on the Thiepval Memorial. Another neighbour, Private Percy Jeffries, who lived at number 7, was killed on July 14th, 1916, aged 23, and is named on the Loos Memorial. James, Edward and Percy are all remembered on the Pageant Road memorial. 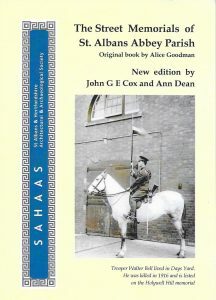 The story of the memorials is recorded by the St Albans and Hertfordshire Architectural and Archaeological Society in a book called The Street Memorials of St Albans Abbey Parish, which has a picture of Walter Bell on horseback on the front page. The 2015 edition of the book, by John Cox and Ann Dean, updated the original by Alice Goodman. It quotes the Bishop of St Albans, the Right Rev David Furse, at the final dedication in 1921, a time of great social unrest and disillusionment. “As they had won the war, they were left to win the peace, but how this is to be done is another matter; the tablets you see have been placed where they will be seen, and should be seen, by those who pass by in future years in the streets where these men once lived. Each of the tablets we have unveiled today bear the words ‘For Remembrance’. I do not suppose that any of you who have lost a husband, son or brother in the war will ever be likely to forget, but there will be others, as the years go by, who will forget, or indeed never know, the price that was paid in those terrible years for what we believed to be for the peace of the world”. Preserving the memorials, though, was not straightforward. There was a loophole. 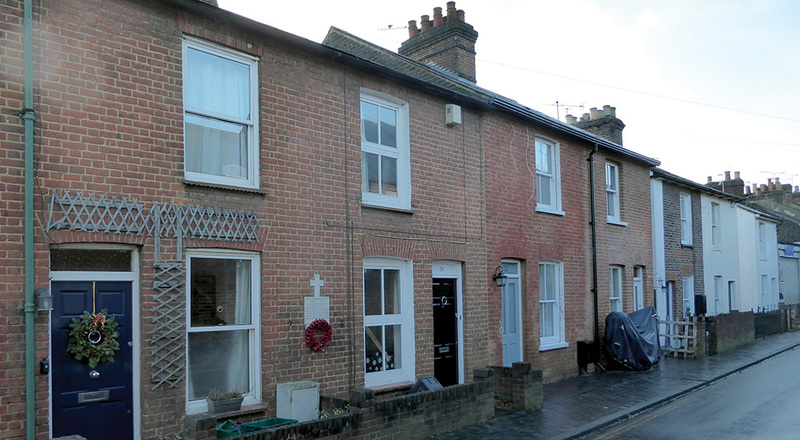 They were paid for by public subscription, but remained the property of the house-owners, making them vulnerable to development, especially as the former humble working class cottages became desirable homes on the fringe of London. One memorial was even painted over because the home-owner thought it ‘morbid’, although it was later replaced a few doors away. 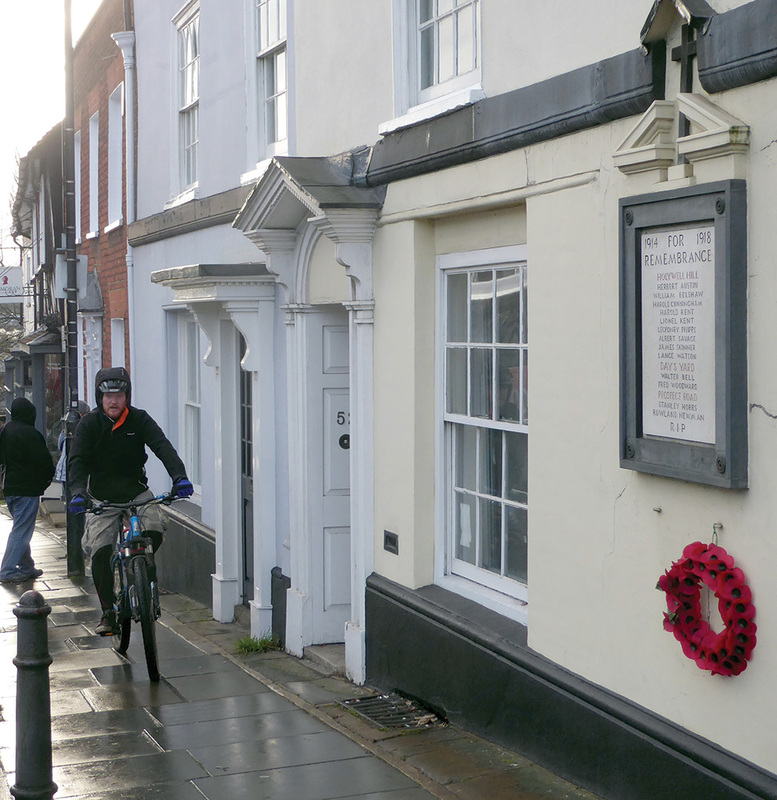 The memorials now have Grade II listed protection. “It’s part of our history, part of our culture. 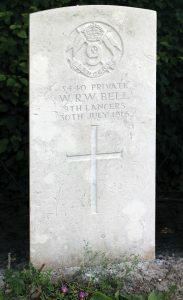 Trooper Walter Bell is now remembered with a plaque at Lochnagar Crater, as well as the Holywell Hill memorial in St Albans. The pictures of Trooper Walter Bell and the Memorial Plaque are courtesy of his nephew, Peter Bell. Other photographs in St. Albans are courtesy of Geoff Meade. 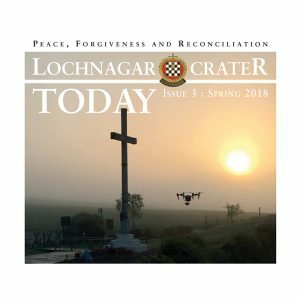 This article is an extract from Lochnagar Crater Today the journal of The Friends of Lochnagar, a publication exclusive to the Friends. To get your exclusive issue and read full articles and be kept up to date on the Crater and activities JOIN NOW.